Insights Qualitativos 2.0: What Kind Of Social Media User Are You? Germans tend to comment more on social media than participants in other EU countries, but not half as much as those in urban China. People in the UK are not as big on tagging or using RSS feeds as others, but they lead Europe in social network participation. These were just some of the factoids I uncovered while having some fun over the weekend playing around with this social media segmentation tool from Forrester Research (I’ll be the first one to admit that only someone who works in market research would call playing with social media segmentation tools a form of fun). 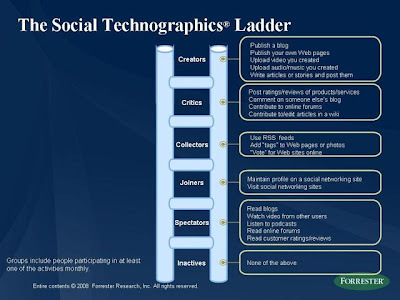 Thanks to the blog mentions by Jeremiah Owyang and Charlene Li at Forrester Research, I found the application, along with its corresponding social media segmentation. My only quibble with the segmentation is that I believe there is a lot more granularity out there for Creators (e.g., I’d imagine there could be some significant differences between those who strictly blog versus heavy YouTube or Flickr uploaders). But the segmentation does do a good job of grouping the population as a whole on something more meaningful than demographics in order to make better sense of them. Maybe, however, there is a micro-segmentation of Creators lurking somewhere under the hood of Forrester’s research. Although social media participation significantly increases the lower on the age range you go, even among the 55+ group in the US, you’ll find that 33% of them are connecting with social applications in some way. 41% of Koreans are Joiners — members of social networks — more than anywhere else in the world. In Urban China, a full 36% are Creators, which means that this very significant percentage of the population is creating blogs, maintaining content, or uploading videos or music. I’d like to play around more with this dataset (hint to Forrester!) and maybe later I’ll have some more insight nuggets to share.